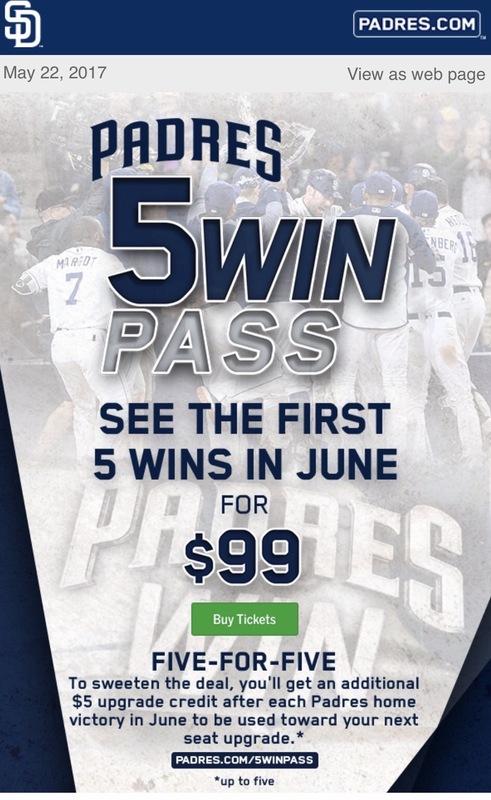 In what can only be considered an act of desperation, the Padres front office released their newest innovation: the 5 win pack. For $99, you get to go to as many games as you can until the Padres reach 5 wins in the month of June (or the month of June ends). This was the Padres response to the growing trend of teams offering a monthly Ballpark Pass currently offered by 14 other Major League teams. And what a lame response it was. The Padres offering is priced higher, and yet offers the worst potential value. And this is all aside from the fact that the team is literally the worst team in baseball. As you can see, the Padres are both the most expensive overall priced option, most expensive price per month, and provides the least possible value by quite a bit. You’ll also notice that it’s not just teams that are in dead last and struggling for fans like the Padres, this list includes 3 teams in first place and 7 teams that are at .500 or better. Yet, the Padres took a look at the competition, took a look at themselves, took a look at their attendance down about 12% so far, and came up with this garbage. Let’s point out the first issue. From a fan’s perspective, the team is incentivizing fans/customers to cheer for the team to lose. After all, if the team goes on a hot streak, which is possible as the Padres scheduled this promotion for the month where they open vs the Rockies, Royals, and Reds, the value of this deal isn’t great. The perverse incentive seems opposite of what most teams, even tanking teams, would want to be pushing among their fan base. And even for me who understands the value of the tank, still finds it difficult while I’m sitting at a game to actively root for the Padres to lose. For me, it’s a thing where IF they lose, you reassure yourself by saying “well it’s for the best”, but I’m not sitting there rooting for Wil Myers to strike out to help the team lose. Well now, the team has created a real incentive to root just for that. The seats are in LF reserved, which tend to sell for around $25 depending on dynamic pricing, but are almost always available for much cheaper on the secondary market. Very worst case, you go to the first five games, the team wins all of them, and you got tickets for about $20 each, saving $5 off face value. That’s not bad. But then you get into the specifics. When I first read the deal, I assumed the deal lasted until you personally go to five winning home games. That’s not the case. As soon as the team wins 5 home games, the deal is terminated. So maybe you go to a couple of the weekend Rockies series games, get busy with work or family, skip a few games, and the team hits 5 home wins. You’ve spent $50 per ticket to sit in crappy seats. To me, deals like this from last place teams shouldn’t have the potential to greatly benefit the team offering it. It should be a loss leader to get fans into the park, a concept that’s foreign to Wayne Partello and this management team who regularly charge over $30 for Park at the Park tickets on weekends inclusive of ticketing fees. So, that’s the worst case. What’s the best case? That the team continues to tank, never hits 5 home wins in June, and you get to go to as many games as you can make it to in June. This is essentially the Ballpark Pass that the other 14 teams are offering. The difference is the Padres’ offering is ranging from 5x to 2x the price of the other team’s offers. Their division rival Diamondbacks, who are 7 games above .500, are offering a deal where you pay $50 for two months of all you can attend, or $25 per month. So then you say, well who wants to watch games in Chase Field; Petco Park has ballpark experience on its side! The Braves are playing in a brand new, state of the art ballpark and are charging $39 a month for their ballpark pass. The Twins in amenity laden Target Field are offering their Ballpark Pass for $50 per month. The Padres offer is blatantly uncompetitive with the competition, and reeks of a front office that has continually and repeatedly been unwilling to improve the value proposition for its customers. The Padres try to sweeten the deal by tossing in $20 of ballpark upgrade credit using the MLB At Bat app, an option I personally regularly use. It works out to being able to upgrade one of your tickets as upgrades tend to be between $12 up to about $22 (depending on dynamic pricing and section). So you’ll be able to upgrade once. This is fine, but again, because the Padres decided to cap the offer at 5 wins, there is still a real potential that the team wins some games against other last place teams and the offer dies off right around the Tigers series in the middle of the month. In the end, this deal just comes across as Nero fiddling while Rome burns. In typical Padresing fashion, they’ve screwed up an opportunity that should have been a slam dunk because they’re unwilling to offer fans and customers a better value proposition. With nearly half of the league offering an all you can watch Ballpark Pass, the Padres, mired in a dreadful season, couldn’t bear to offer the same and instead offer the same kind of cut rate trash we’ve seen since Mike Dee and his underlings, many of which are still in positions of power for some unknown and terrible reason even after Dee’s embarrassing firing, took over the business side of the house in 2012.